I am super excited to write this blog as it will tell a super-cool story, about three super companies, doing super things to invest in the youth of our super nation. Junior Achievement … it’s just super! Can one person make a difference in our communities? How about in the lives of our youth? And if one person can make a difference, image what a corporation can do? The differences we make in our communities – and in our youth – are important. And, they get more important as our world gets smaller. Corporations have many ways of supporting their communities, besides creating jobs and paying local taxes. They can provide educational grants, encourage employee involvement, and make cash contributions to community organizations. I’m happy to say Schneider Electric does all of these things. And, I’m proud to be part of such a great organization. But there is one community project in particular, where Schneider Electric was intimately involved, that I find quite admirable. It’s all about an organization called Junior Achievement and how they are investing in our kids – our nation’s future. And that is the super-cool story I want to tell you about today. Junior Achievement is the world’s largest organization dedicated to educating middle-school students in hopes of preparing them for tomorrow’s business world. 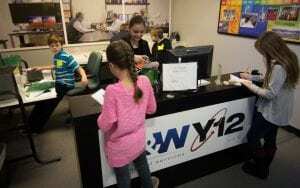 Their program is called BizTown and Tennessee is home to three BizTown locations. From banks to radio stations to restaurants and more, children get to form and operate their own businesses, manage finances, and grow their companies – all under the guidance of Junior Achievement staff and volunteers. 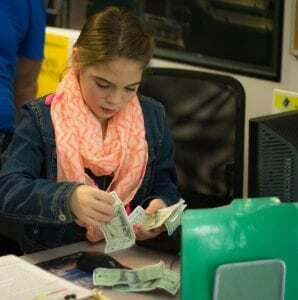 Acting as adults in these roles, and through daily lessons, the children learn the value of money, how to work as a team, and how their school education is closely linked with their BizTown education. This incredible experience enables these kids to gain valuable first-hand experience that will help them throughout their professional (and personal) lives. JA impacted over 4.6 million U.S. students in more than 201,000 classrooms during 2014-2015. Like most non-profits, Junior Achievement faces all the budgetary challenges that regular businesses do, but without the same financial resources to offset the impact. They rely on donations and help from the community and local corporations. Schneider Electric and C-Tech Controls, both with long-standing relationships with Junior Achievement, wanted to do just that. Help. 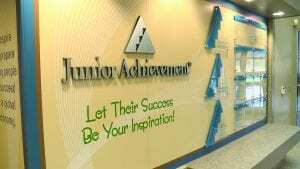 Not only directly help Junior Achievement, but also indirectly help the kids partaking in the BizTown program. Thus, the idea was born: Why not donate a building management system–and the installation–to Junior Achievement’s three Tennessee facilities? Dakota Blair, Project Engineer at Schneider Electric, was one of the people who helped make it all happen. As Dakota proudly boasts, “We saw this as a great opportunity to make a lasting contribution to a great organization.” And with that, Dakota worked with Junior Achievement leaders to arrange facility upgrades via the implementation of the Schneider Electric’s cloud-based building management solution, Building Insights Pro, at three locations in Nashville, Memphis, and Knoxville. 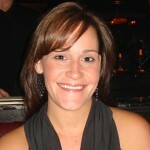 And, Schneider Electric gladly donated the entire integrated solution to this important organization. 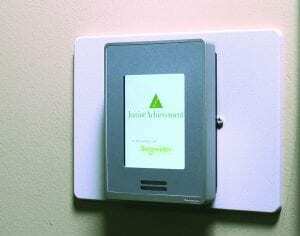 From power meters to room controllers to sensors and light relays – it was all free of charge. But what about the installation? Well, Dakota also enlisted the help of C-Tech Controls, a local systems integrator, who happily provided installation and labor, again, free of charge. C-Tech Founder and President Larry Helms was eager to assist, “As an entrepreneur, I’m very interested in helping the next generation in our country learn about business and grow their talent…Junior Achievement is just a great organization, so we were happy to help with the project.” I must take my hat off to both Schneider Electric and C-Tech Controls; what a great way for corporations to pay it forward in their communities. The best part of this entire story is that Junior Achievement can take the money they are saving from reduced energy and utility bills, and reinvest it in what is most important – the kids. I told you, this is a super story! Helping non-profits save energy costs is a good thing by itself. But there’s potentially a lot more. You see, now Junior Achievement has the ability to bring energy management into the program, giving the children first-hand experience in using energy wisely and cost-effectively. The organization hasn’t done this yet, but they’re looking at the possibility. And when they’re ready they’ll be able to do it, because the system that was installed can support remote access and control for the kids as well. The next generation of business leaders will need a lot of help with energy management. Companies like Schneider Electric can do much to prepare them, not just by getting involved personally through employee volunteers, but by donating their products and services. Or, to paraphrase the old adage, by “putting our products where our mouth is.” To read more about this project and learn all the wonderful details, download the complete case study. It’s a model for community involvement that more companies could follow, and I hope they will. Watch for my next blog where I’ll talk about some of the other contributions Schneider Electric is making to support communities all over the world. And, I invite you take a peek at some of the other energy-related and BMS-related blogs I’ve published! As always, I would love to hear your thoughts. Please leave me a comment below!